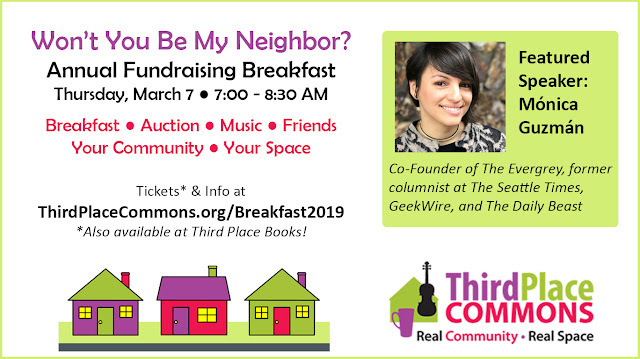 Get your tickets today for Third Place Commons’ annual community breakfast, a lively, fast-paced event that is the Commons’ biggest fundraiser of the year. Coming up fast on Thursday, March 7th, this event is the perfect time to join with friends, colleagues, and neighbors in supporting the extraordinary community that is fostered all year round at the Commons and at the Lake Forest Park Farmers Market. 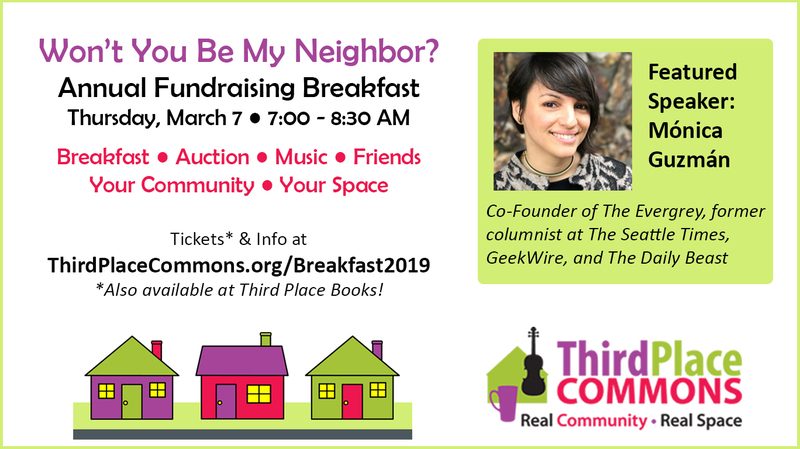 This year’s event – entitled “Won’t You Be My Neighbor?” – will be a celebration of the bonds that unite our Commons community in good times and bad alike. Featured speaker Mónica Guzmán will share her thoughts on our vital connections as a community of neighbors. Guzmán is co-founder and director of The Evergrey, a daily newsletter that helps thousands of Seattleites make the most of their city. She is a former columnist at The Seattle Times, GeekWire, The Daily Beast, and The Columbia Journalism Review, and studied ways to build closer connections between journalists and the public as a 2016 Nieman Fellow at Harvard University. Read more about Guzmán here. Per tradition, the ever-popular Milner Family Fiddles will be on-hand to serve up a warm, musical welcome to one and all. Longtime local favorites, the Milners play regularly at the Commons and elsewhere in a rotating roster of family members, led by Glen Milner. Milner will be joined once again at the breakfast by his daughter Alisa McFeron and her husband (and past breakfast speaker) Ian McFeron. A big thank you to this year’s Platinum Sponsors Merlone Geier Partners, owners of Lake Forest Park Town Center, and Republic Services for their generous support to help make this wonderful community celebration possible! Third Place Commons is a community-supported 501(c)3 nonprofit organization dedicated to fostering real community in real space, and this is your chance to show your support for that vibrant community. The event will also feature a fast-moving live auction featuring fabulous goodies for every interest. Visit the event page to learn more or get your tickets now for the big event!